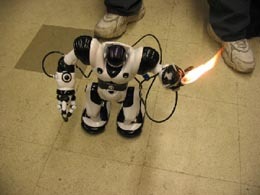 A Flamethrowing Robosapien | OhGizmo! Hell yeah, I say! Especially when you’re going to be putting a flamethrower on a Robosapien. Some dude named Adam Plavinskis did just that, and posted a few pictures right here. Story VIA The Raw Feed. ??????? ?, ??????-?? ?????? ?, ?????? ?? ???? ??! Being the kid at heart that I am, I have been debating whether or not to get a Robosapien. Now that I’ve seen this, it only increases the “need”! Great.Its a nice little Robo.Thanks I wonder if their are any Girly Robo’s been made like barbie dolls Robo. this bot is very cool.I think it can do more thing!